EMC Data Domain Boost coming to Veeam Availability Suite v8! When it comes to a major release, we focus a lot on new features that solve real problems that customers have today. One of the features I’m personally excited about with v8 is support for EMC Data Domain Boost. There are a number of benefits when using EMC Data Domain Boost with Veeam Availability Suite™ v8, let’s take a tour through those benefits. By integrating EMC Data Domain Boost with backup jobs in v8, we can leverage advanced source side deduplication to avoid sending data already stored on Data Domain storage, as well as create new full backup files without physically moving data into the file, but rather by synthesizing them from the existing data. I’ve been using our internal preview of v8, and many of the tasks that we frequently use are made quicker with EMC Data Domain Boost. Let’s look first at the synthetic full backup. The same VM on left had its synthetic full produced with EMC Data Domain Boost (11 minutes and 27 seconds) and the one on the right had it produced without (2 hours and 54 minutes). Yes, this makes it over 15 times faster! If you prefer having an active full backup instead of a synthetic full, you’ll see performance improvements there as well. By leveraging advanced source side deduplication, network transfers to the Data Domain deduplication appliance are reduced if the blocks already exist on the storage. You can see that in action in the synthetic full example above with the amount of transferred data from the incremental backup in the first step. The red line below indicates active transfer on the full backup, which is much lower on the left. On the right, without EMC Data Domain Boost, the transfer burden is much higher. Why have a synthetic full or active full backup? That’s likely why companies invest in a deduplication appliance in the first place. Having multiple, discreet full backups as a restore point can address retention requirements and provide data portability for points in time. That’s one of the true beauties of an EMC Data Domain deduplicating storage system, it will receives scores of full backups yet take very little additional space to store the additional full backups. Anything you can do to reduce the stress on primary storage, such as an active full backup, will be wise for the ongoing performance of your virtualized infrastructure. Couple that with the additional data protection options and high performance deduplication, and you are on your way to Availability For The Modern Data Center™! 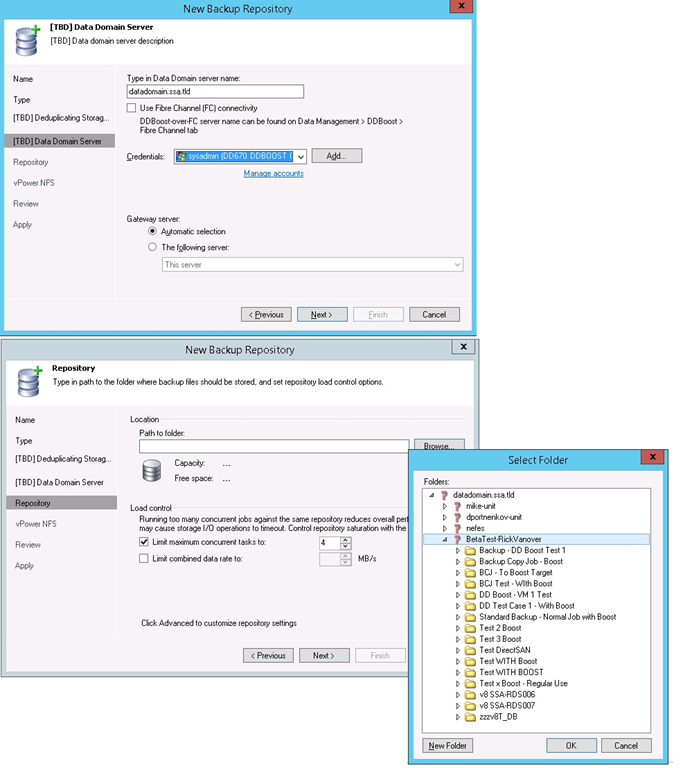 Configuring EMC Data Boost in Veeam Availability Suite v8 is Easy! One of the key things we’ve done for EMC Data Domain Boost support with Veeam Availability Suite v8 is make it an easy configuration step. It will be built into the repository wizard with a call out to select an EMC Data Domain target with Boost enabled. From there, we simply populate the name of the appliance, credentials and determine a path to the disk system. For those with a keen eye you will see there is an option to use direct Fibre Channel connectivity for writing backups to the EMC Data Domain appliance. With this option, you can leverage the storage network to write backups into the EMC Data Domain appliance. Supplemented with direct from SAN backup modes provided by Veeam for both vSphere and Hyper-V, this allows achieving true LAN-free backup of your VMs with no impact on your production networks. Get ready for faster backups! If you are using EMC Data Domain deduplicating storage, then you’ll be very interested to give Veeam Availability Suite v8 a look. You can read more about EMC Data Domain Boost Support in Veeam Availability Suite here. Our current tech preview has EMC Data Domain support, as will upcoming betas. Reach out to your Veeam sales team for access to this preview. 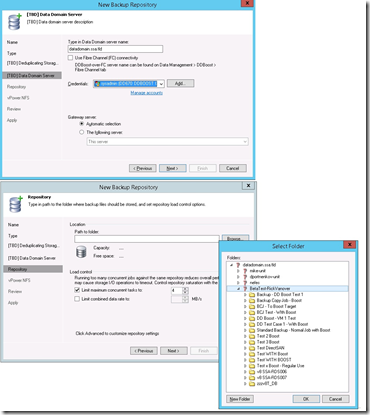 Does EMC Data Domain Boost interest you for Veeam Backups? Share your comments below. Read more this and other Veeam Availability Suite features here. Additionally, we just completed a short webinar on this feature which is available for replay here.